By 1932, U.S. unemployment reached almost 25 percent of the labor force. Car sales slumped, nightclubs closed, and hobbies boomed. NIST incurred substantial cuts in research funding and staff. Some professional staff refused their imposed furloughs, preferring to work without pay. Because industry called on NIST (and national laboratories abroad) less often than before, the Depression years were a time of international conferences, interlaboratory comparisons, and ex-changes of data and equipment looking to develop new or improved international standards. For instance, NIST and an industry standards association agreed on a new ratio between the inch and the millimeter so that precision measurement would be on the same basis in England and the United States, an aid to American exporters. Despite cutbacks in industrial research, many fundamental studies, such as the development of photometric units (for measuring visible light according to the sensitivity of the human eye) and research on radiation and spectroanalysis, advanced during these years. This work was useful to both science and industry and won wide acknowledgment. Some NIST research in applied technology was terminated; there was a continuing debate over how far the Institute should venture into these areas. 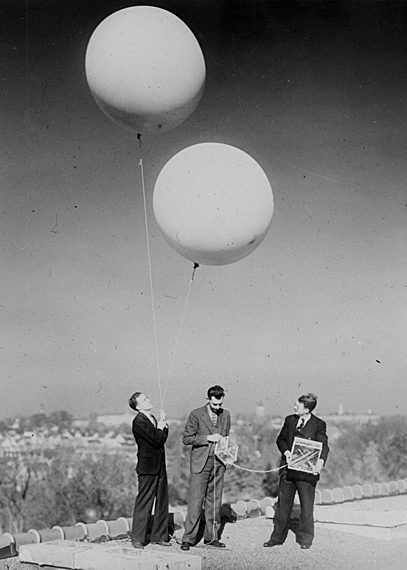 By 1940, the NIST/Navy radiosonde was an integral part of U.S. weather forecasting with some 35,000 units being built annually. But it did venture into uncharted territory nonetheless. The advances in aeronautics and radio in the 1920s led to a period of worldwide exploration during the 1930s, with trips to Antarctica and balloon flights into the stratosphere sponsored by the National Geographic Society. In 1936 from the USSR, NIST made the first natural-color photographs ever of a total solar eclipse, using a custom-made camera and lens. Many precision measurements then were being made in terms of light waves. With international agreement on definitions and advances in spectroscopy enabling the search for superior types of light for this purpose, it was hoped that many difficulties impeding the international interchangeability of parts might be solved. NIST developed a method for the use of cadmium and krypton wavelengths in the measurement of precision gage blocks that permitted their certification to an accuracy three times better than before. NIST began a tradition of contributing to Nobel Prize-winning research by other scientists when its cryogenics lab was used to confirm the existence of deuterium, or "heavy hydrogen." This isotope of hydrogen was discovered by a guest researcher, who subsequently won the Nobel Prize in chemistry. A NIST scientist separated the isotope. These scientists expected that deuterium would be useful for research or practical devices such as neon signs; they had no idea that it would later become a vital ingredient in the making of nuclear bombs. In work of interest to the general public, NIST supported the consumers' movement of the 1930s by advising consumer labs on test instruments and equipment and devising new ones. Following magazine articles and publicity about its work, NIST was deluged with letters from the public asking for assistance on all types of problems, from increasing the birth rate of pigs to obtaining devices to locate buried treasure. In a single three-day period in 1939, almost 800 letters arrived requesting technical information, along with a similar number of telephone calls, 459 letters asking for publications, and 429 visitors asking for scientific or technical information.